Module 1 & 2 contain all the basic GIS information and QGIS course material needed to kick start your GIS experience. In this module the student is introduced to the basics of GIS. The topics covered in this theoretical presentation, and accompanying documentation, are critical to understanding the processes and QGIS course material covered in module 2. This presentation is aimed at the GIS novice but students familiar with GIS will find the module useful for reviewing the fundamentals of GIS. Although SMS prefers to customize tutorials to suit a clients specific GIS requirements there are a number of standard tutorials to choose from (listed below). For students new to QGIS, tutorials 1 - 4 are recommended as a starting point. The tutorials listed show examples of standard QGIS course content. Spatial Modelling Solutions taylor QGIS course material to suit a clients specific spatial requirements where possible. Please contact us should you wish to know more. Prior to any course we spend a small amount of time loading QGIS onto the students computers. QGIS is a freeware GIS software solution and all setup files are freely accessible online but will also be provided by us. QGIS can be loaded onto computers running on Windows, Mac OS X or Linux operating systems. 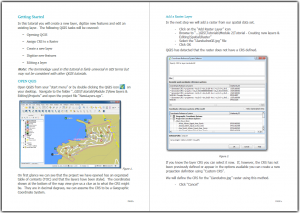 All QGIS course material is included in the form of hardcopy and PDF softcopy documents. The spatial data and QGIS project files are provided digitally and stored in their respective tutorial folders in a logical folder structure. In this short tutorial we familiarize the GIS student with the basics of the GIS desktop solution QGIS. We open and explore QGIS through the Desktop and Browser GUIs where we will create our first map. In this introductory tutorial we will also explore some of the basic tools and GIS map navigation options. Lastly the user will be introduced to the layer styling options also commonly referred to as layer symbology. Subsequent tutorials will cover layer symbology (in more detail), labeling and creating a map layout for exporting or printing. At their most basic level "desktop GIS software solutions" can be used to create maps and this is probably still one of their most commons uses. In this tutorial the QGIS students will create a basic map from start to finish. This will involve adding new vector and raster layers, editing their styles, labeling and finally creating a map layout. The tasks covered in this tutorial include: Setting the project Coordinate Reference System (CRS), adding spatial data, symbolizing layers, labelling features and activating an external plugin. A fundamental feature of any GIS is the ability to create, store and manipulate spatial data. 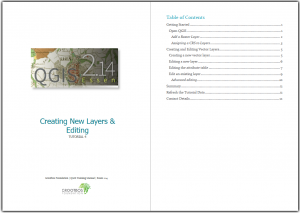 In this tutorial we will edit features of an existing layer as well as create a new layers and capture or digitize new features. QGIS has an on the fly transformation feature which allows the programme to project layers to the same location provided they have an assigned CRS. We will examine this feature by adding data that has no spatial reference and subsequently define its CRS. Geoprocessing is the term used to describe the GIS process of manipulating spatial data. For the purposes of this tutorial the objective is to determine the development potential of a site with regards physical and environmental constraints. Students are introduced to the QGIS geoprocessing and data management tools through this fictitious case study. Some of the tasks covered in this tutorial include: Buffering, clipping, merging, union, dissolve, working with CAD data and spatial joins. In this tutorial we will import a set of coordinates from a text file to be used in spatially referencing an image. The process of referencing a layer spatially is called georeferencing. This involves identifying features common to both an existing "spatially referenced" layer and the layer that is not yet referenced. These common features are marked using ground control points. Once an adequate number of ground control point have been set the layer can be transformed or referenced spatially. The eVis plugin is a useful QGIS add on that allows the user to link external files like photographs, documents and even webpages to features in a layer through a hyperlink in the attribute table. Google Earth is probably the most popular online GIS. Spatial data can be shared through the use of the kml and kmz file formats making it a great way to communicate your ideas across various GIS platforms. The objective of this tutorial is to create layers in Google Earth and import them for editing in QGIS. The final edited layers will then be uploaded to Google Maps which can be accessed via the Google Earth app on an iPad. PostGIS is a spatial extension for the PostgreSQL database management system. The PostGIS extension gives PostgreSQL the ability to store and manipulate spatial objects. In this tutorial we will install PostgreSQL, create a new spatial database and upload spatial data. We will then make a connection in QGIS where the data will be viewed and queried. GRASS which stands for Geographic Resources Analysis Support System is a GIS used for processing many types of data. It was developed by the US army as a land management and planning tool in the mid 80's. QGIS provides integration with GRASS giving it added functionality by accessing the vast range of GRASS tools. In this tutorial we setup a GRASS working environment then import vector and rater data for analysis. In our example we create a DTM from contours and calculate the slope and aspect for a portion of land for development purposes.